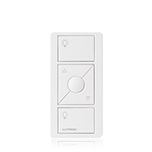 Provides on, off, preset and raise/lower for lighting control; open, close, preset and raise/lower for control of automated shades; or open, close, preset and adjust buttons for control of automated drapes. In addition, blind control option provides open, close, preset and tilt. Raise/lower control for blind control is achieved through the stop-while-moving functionality of open and close buttons. 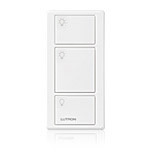 Provides on, off, and raise/lower for lighting control. Provides on, off, and preset for lighting control. Not available for China or Singapore at 868 Mhz limited channel. 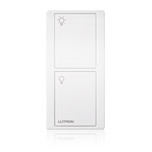 Provides on and off for lighting and power control. 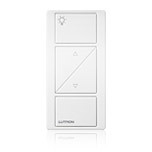 Lutron offers accessories to enhance the flexibility of the Pico wireless control. 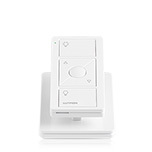 The tabletop pedestal is offered in configurations to support up to 4 Pico wireless controls and is available in white or black finishes. When mounting a Pico to a wall or over an existing wallbox, the wallbox adapter allows for easy installation of the control in a Claro faceplate. † Currently only available with Serena Remote-Controlled Shades in Hong Kong.